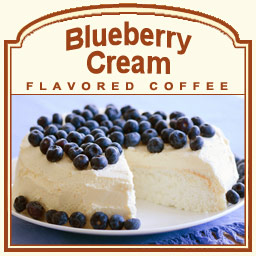 Blueberry Cream is the perfect flavored coffee with its creamy and succulent blueberry taste. With a tangy-sweet flavor that is blended with a creamy richness, this Blueberry Cream flavored coffee proves to be sweet and smooth. 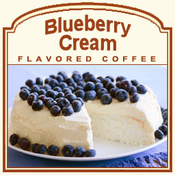 Made with 100% Arabica beans that have a delicious gourmet flavor, each cup of this Blueberry Cream will taste decadent, and it only has 2 calories � so go ahead and give into your blueberry obsession! Mmm, so delicious! A heat-sealed valve bag will ensure the freshest coffee possible by roasting and shipping it on the same day. For a full flavor of blueberries that will melt in your mouth, this Blueberry Cream will hit the spot with its lusciously sweet fruitiness.